Case A12. Old Anteroseptal Infarction. St Emlyn’s ECG Library. The EGG was recorded from a 66 year old man who was asymptomatic. The EGG was requested by the patient’s general practitioner because of a history of infarction several years previously when the patient lived in a different part of the country; there were no details about the episode in his notes. The ECG shows late appearance of R waves in the precordial leads. There is virtually no R wave in V3 which is the same height or even slightly smaller than die R wave in V2. The R wave in V4 is 14mm, slighUy smaller than the R wave in V5 (16mm). The remainder of the ECG is normal. The apparent Q wave in III is in fact an S wave as there is a small r wave recorded before this – the QRS complex being an rSR’ complex in this lead. The Q wave in lead aVF is not pathological being less than .04 seconds and less than 25% of the height of the following R wave. The ECG does not provide definite evidence of previous infarction, the only clue to possible infarction being the pattern of R wave progression in the precordial leads. 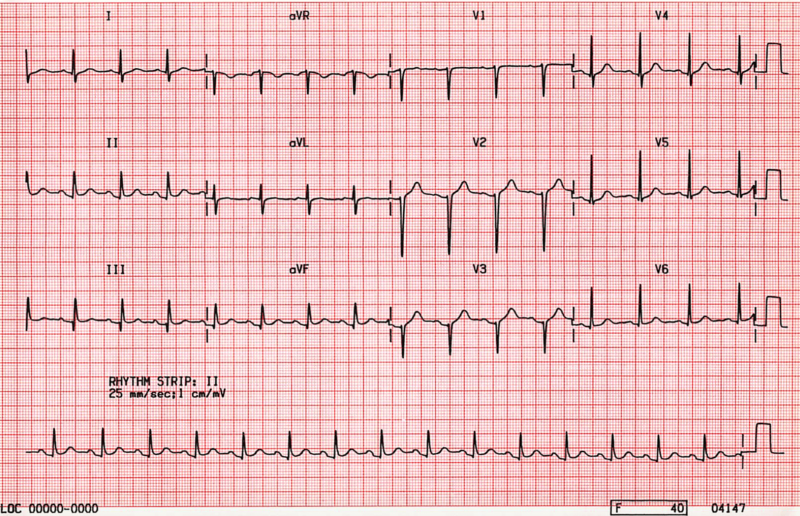 The ECG could be said to be compatible with old infarction, although not diagnostic.